The Ontario Hockey League on Monday announced that Arizona Coyotes prospect Christian Dvorak of the London Knights is the Pioneer Energy OHL Player of the Week for the week ending Dec. 13 and then Tuesday, was also awarded the same honor for the Canadian Hockey League (CHL). The CHL encompasses the OHL, Western Hockey League and Quebec Major Junior Hockey League. Last week, Dvorak led the league with seven points in two games, scoring three goals and four assists with a plus-minus rating of plus-5. 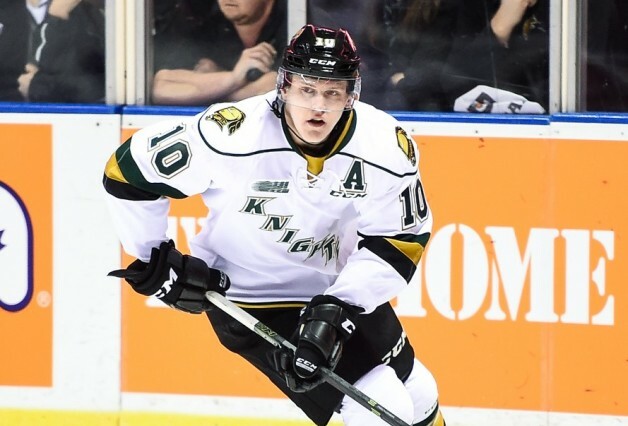 Dvorak earns the award for the second time in three weeks after a pair of multi-point performances lifted him into first place in the OHL’s scoring race and extended the Knights’ winning streak to nine games. Last Thursday night, he scored a goal and two assists earning first star honors in a 6-3 road win over the Barrie Colts and then scored two goals and two assists for four points on Friday as first star of an 8-1 win over the Sudbury Wolves. Dvorak now has points in 17 straight games and holds the second-longest active point streak in the OHL behind teammate Mitchell Marner’s 19-game streak. A 19-year-old from Frankfort, Ill., Dvorak is playing in his third OHL season with the Knights and leads the league with 65 points (28 goals, 37 assists) in 27 games. He was a second-round pick of the Coyotes in the 2014 NHL draft and is also one of eight OHL players, including fellow Coyotes draft pick Ryan MacInnis, invited to attend the U.S. National Junior Team Selection Camp. Also considered for the award this week was Winnipeg Jets prospect and Phoenix native Brendan Lemieux of the Windsor Spitfires, who scored four goals and two assists for six points in three games.